The WM401 - MuxDAC Evaluation Board - generates CW sinusoidal waveforms at frequencies of fractions of the sampling clock, from 1/64 to 31/64 of the data sampling rate. The WM401 can be controlled by a PC via a USB interface. 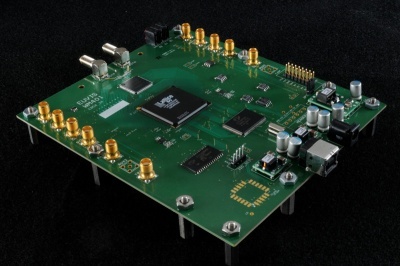 The module comprises a MUXDAC, MD652D or MD662H, which has 12-bit amplitude resolution. The module can be clocked from 2 GHz to 4 GHz. At a 4 GHz clock, the sampling rate is 4 GSPS for the MD652D and 8 GSPS for the MD662H. It is equipped with a Lattice SC LFSC3GA25E-7FN900CES FPGA, which is programmed to generate CW sinusoidal waveforms only and is not for re-programming. or complex waveform generation, please use the Euvis arbitrary waveform generators (AWG). The WM401 is powered by a 12V wall-mount AC adapter. Email: info@euvis.com to get pricing information.